Welcome to the Knights of St. Andrew International Gathering in Omaha, Nebraska on May 20-21, 2016. We will work to have all the information updated on this site. You can always call us at the Omaha Scottish Rite at (402) 342-1300 or e-mail micah@SRNE.org. We are excited to welcome you to the KSA International Gathering, with this year's theme focusing on SERVICE and LEADERSHIP. Across the nation, we have found that the Knights of St. Andrew has been a leading vehicle to get new 32° "Black Hat" Masons involved in the Scottish Rite. Knights get to meet members, get known themselves, and find themselves serving as line officers and leaders. SERVICE and LEADERSHIP have become a recurring pattern of KSA "chapters" across the nation, and this year's conference focus on that. Because the KSA is not ubiquitous across the northern and southern jurisdiction, we welcome any Scottish Rite Mason, black hat service group, or brother interested in learning more. For Valleys interested in starting a KSA, we will include sessions on how to start a KSA and make an integral organization to develop 32° brothers into tomorrow's leaders of your Valley. Our goal is to make this page a one-stop shop for information on the conference. You can always e-mail us at micah@SRNE.org or call the Valley at (402) 342-1300 for more information. Click above to download a registration brochure to mail in. We are offering a special Early Bird registration price of $100, good through April 30. Registration will be $125 afterward. Registration costs includes the Friday night dinner, Saturday luncheon and keynote speaker, and Saturday prime rib banquet at the Scottish Rite and the Celebrating the Craft party afterward. For ladies, registration is $50, which will include the Friday night dinner, Saturday luncheon, and Saturday banquet/Celebrating the Craft party, as well as one of the breakout sessions specifically for ladies. The Valley of Omaha KSA has received many requests for a paper registration brochure. We've listened and we have one to download through the PDF link at the right. This will also be sent to Valley General Secretaries in early March to share with KSA Chapters and black hat leaders. You can either register online below or simply print the flier on the right and mail it in with payment to Omaha Knights of St. Andrew, Scottish Rite Masonic Center, 202 South 20th Street, Omaha, Nebraska 68102. Other than the Saturday banquet, the conference will be at the Downtown Doubletree Hotel in Omaha, which is five blocks from the Scottish Rite Masonic Center (or about 10 minutes walk), and a short drive or walk to many of Omaha's downtown museums, shops, galleries, and attractions. We have arranged for a rate of $110/night plus tax, which includes parking, breakfast, and wi-fi in the room. The special rate is good through April 20th, and you can book online through this link: http://doubletree.hilton.com/en/dt/groups/personalized/O/OMAH-DT-SRM-20160520/index.jhtml or the button below. E-mail micah@SRNE.org with your proposals. We are particularly proud to welcome our keynote speaker is Col. John Hinck, Brother and Scottish Rite Mason from the Orient of California. John is a PhD student at the University of San Diego studying organizational leadership and consulting. As an Adjunct Professor at National University, he teaches organizational leadership related classes in the School of Business and Management. Before moving westward to pursue his passion, John taught college in Michigan, then moved to Kansas City to serve as the General Operations Manager at Bishop-McCann, the brand experiences agency. A former Army Colonel with 22+ years of serving our country as a combat leader and Apache Longbow pilot, John founded Strength and Honor Solutions. He is devoted to developing tailored solutions to strengthen individual and organizational character while honoring personal values and company culture. "Before bedtime in the Hinck household, my father read stories from the Bible and other great books to my twin brother an me. While in the Army, stories were always swapped around the barracks, in a motor pool, on a flight line, and during deployment. People have often gravitated toward the personal and military stories I have shared on leadership, character, and values. Who doesn't like a good story? They can make us laugh, smile, think, or cry. Over the course of 22 years as an Apache pilot and leader in the Army spanning a number of different posts and deployments in South Korea, Germany, Albania, and Afghanistan, I filled 26 little green books with thousand of observations and lessons. Strength and Honor is my effort to share 64 of the best leadership stories I learned from my family, the church, Masonry, and the military. Strength and Honor is about living your own values and discovering the authenticity to live the best life possible." Copy of John's book "Strength and Honor"
We think that's a lot of value to give you, so we hope you will join us in May for the 3rd Biennial KSA Gathering! The Valley of Omaha Scottish Rite has served Nebraska's Masons since 1867, chartered just 3 months after Nebraska was made a state. After a rocky start, during which one new member noted ". . . [W]e sat from 9:00 a.m. until 11:00 p.m. for three days, in an atmosphere so dense and foul with tobacco smoke we could cut it with a knife, while Bro. Webber read to us the secret Work of the several degrees, during which but few were fully awake much of the time and knew little more at the close than at the beginning. Under these conditions it is unnecessary to say that the impressions received were far from what they should have been." By 1881, the Scottish Rite was thriving! In 1906, land was acquired "west of downtown," and 8 years later, Scottish Rite Masons dedicated the beautiful Neoclassical Cathedral, which is listed on the National Register of Historic Places and welcomes 3 Blue Lodges, and 1,200 Omaha Scottish Rite Masons. Members dedicated "the Ashlars" in 2013, celebrating the symbolism of the Rough and Perfect Ashlars, the Grand Cross Conference room in 2014, and a beautifully painted mural and garden in 2015. 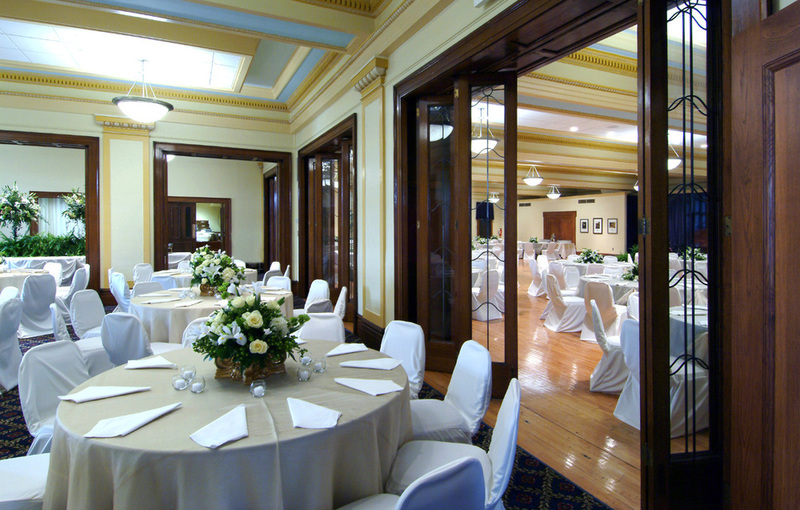 Besides Masonic events, the Scottish Rite Masonic Center hosts weddings, concerts, lectures, business meetings, and public events of all types. We're pretty proud of our track record of engaging members through Lodge dinners, wine and scotch tastings, our innovative Ethics on Trial program, RiteCare Classic golf outing, WalkRite for RiteCare, Friends of Scottish Rite dinner and auction, family picnic, Spring and Fall outings, our Broadway Series, Lenten fish fry Fridays, Master Craftsmen classes, and so much more. Our members are proud of so many activities and events that keep Masons coming back - and bringing new members! We have a strong unity between our Lodges, York Rite bodies, Tangier Shrine, and Grand Lodge, and we think the Omaha Valley has much to share with brethren from around the nation! The Knights of St. Andrew was chartered in 2001 by the Valley of Wichita, Kansas. While black hats are the Active members and leadership of the KSA, Red Hats and White Hats continue to be active volunteers and mentors. Our members have served as line officers and volunteers, and we are an active group! Knights are always present greeting at events, bartending, setting up for or cleaning up after Lodge dinners, mentoring new members, and calling members on their birthdays. Sometimes it is hard to distinguish where the Knights stop and "regular" membership begins because our KSA members are so involved in every aspect of the Valley! While our Emeritus members (32° KCCH and 33°) can't hold office in the KSA or vote, they are still active as volunteers at many of our events. The Nebraska Knights of St. Andrew are proud to be your hosts for the 2016 KSA International Gathering! Still have questions? Contact the Scottish Rite at (402) 342-1300 or e-mail Micah Evans at micah@SRNE.org.